Spot Cool Stuff recently reviewed a selection of landscapes, trees and buildings that resemble scenes from a Dr. Seuss book. If you read that you might be asking yourself Well, what if the good Doctor were to design a lake? 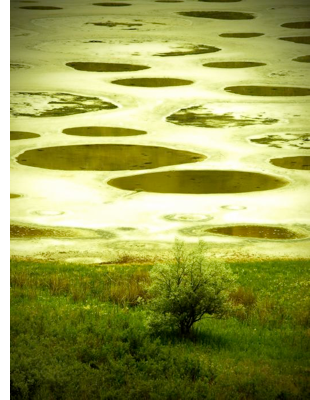 That Seussian lake it would surely look like the Spotted Lake, located a little more than a kilometer (and a little less than a mile) north of the Washington state line in British Columbia, Canada. 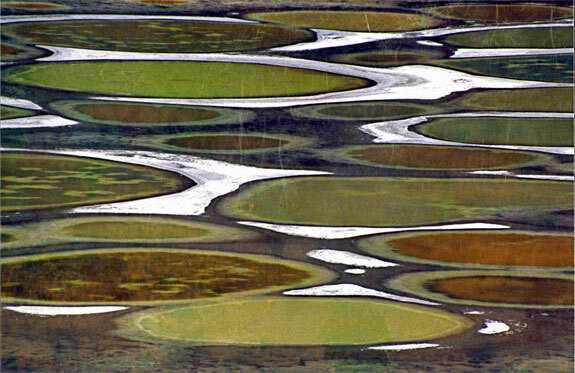 The ameoba-shaped Spotted Lake, or Klikuk in the indigenous language, changes colors throughout the year and during the summer time divides itself into white, green or yellow pools. 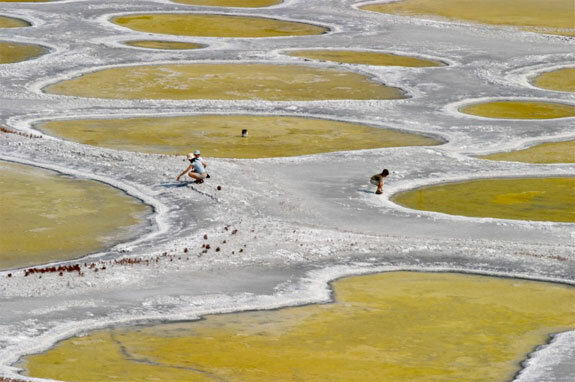 The unusual qualities of the lake are the result of the massively high concentrations of salts, titanium, calcium, sulphates and other minerals that form “walkways” underwater when the lake is fully covered. After evaporation lowers the lake level in hot weather the walkways, and the “spots” they frame, are revealed. Or, at least, that’s the scientific explanation. When you visit in person it is more fun to imagine that you are living within the scene of a Dr. Seuss book. 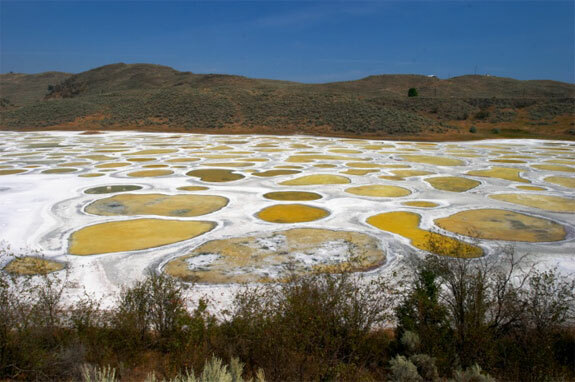 If you go: Officially, Spotted Lake is on private land and therefore theoretically not accessible for close up observation. The closest you get (but still a good view) is from the shoulder of Highway 3. 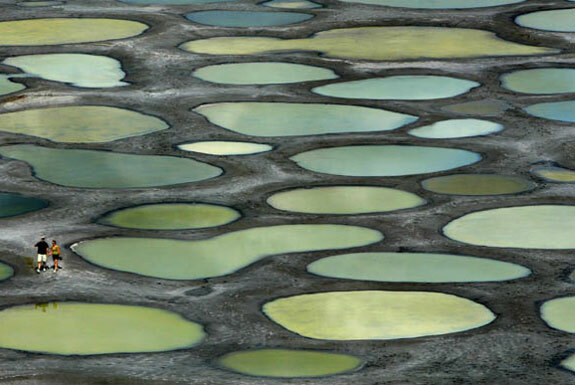 There are other smaller “spotted lakes” in the region. Following Highway 3 from Keremeos to Osoyoos you should be able to see at least three other spotted lakes on the right hand side dropping down into Osoyoos for the last 15 kilometers or so. When to go: Anytime but the lake’s spots show most from June to through September. 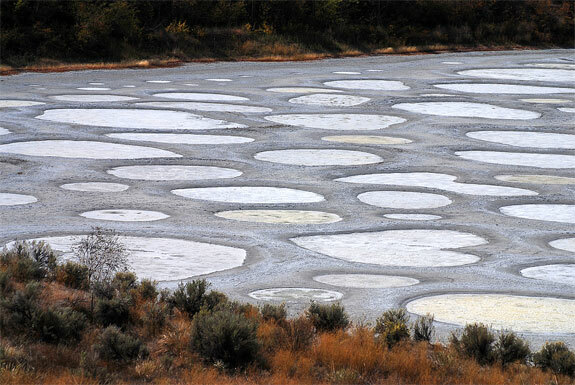 Where to stay: The Spotted Lake is near the town of Osoyoos, BC. The Walnut Beach Resort is the best choice among the larger resorts and hotels. Osoyoos also has a handful of bed and breakfasts of which we’re partial to The del Ray B&B. Amazing Palau: Dive Into a Lake Full of Jellyfish! I live here and it is a very beautiful and special place, if you wanted to learn more you could visit either the desert center or the culutral center where they would be glad to give insight. This is a good moonscape style shot and the people add scale to the lakes. You are right in saying it could be out of a Dr Seuss story. Great how you find these things! Just back from travel, but you make me want to go again.